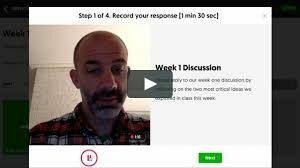 Flipgrid elevates text-based discussion forums with teacher and student constructed videos. Teachers and students can create a grid about a specific topic and encourage peers and even people from around the world to record a short video about the topic! Flipgrid allows learners of all ages to find their voices, share their voices, and respect the diverse voices of others. Flipgrid students build and strengthen social learning communities as they discuss their ideas and experiences with their peers. 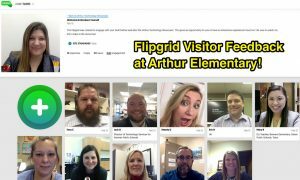 Flipgrid amplifies student voice and supports student development of global empathy as they immerse themselves in each other’s learning processes and perspectives. Substitution: Students create a flipgrid video to engage in a discussion instead of instead of engaging face-to-face in a classroom setting. Augmentation: All students engage in the discussion, by adding comments and follow-up videos, over an extended period (e.g., 1-2 weeks). Modification: Students can create their own grids with prompts about a topic, solicit video responses, and analyze them for class. Redefinition: Students are able to discuss their ideas and experiences with professionals, experts, and scholars around the world. Here is an example of a teacher who created a grid for a class discussion! Math: Ask students to compare mathematical concepts that have both similarities and differences, like adding and subtracting, laws of sine and cosine, or the qualities of different geometric objects. Invite mathematicians to discuss real-world math topics. Science: Have students choose a work of scientific non-fiction from the school library and describe it along with its illustrations. Ask students to choose a favorite plant or animal and describe it using all five senses. Reading/Language Arts: Post a response to reading a book or article. Have students respond to each other. Ask students to share a favorite book, word, adjective, pronoun, verb, and explain why it is their favorite. Invite students to share a time when they incorrectly used a word and how they came to realize the mistake. Encourage students to describe their happiest memory of reading. Arts: Have students record a Flipgrid video of themselves performing a specific song on their instrument or drawing/painting/constructing a piece of art. Other: At the beginning of a quarter/semester/year, have the students record a Flipgrid introducing themselves to you and their fellow classmates. Student’s can offer support/guidance for incoming students at semester change or the end of the school year. Go to http://www.flipgrid.com. Click on the “Sign Up For Free” box in the upper right hand portion of the screen. Next, you’ll want to create a “New Grid” by clicking on the blue “New Grid” button on the My Grids page. Unless you purchase a classroom version of Flipgrid, you will only be allowed to have one grid. Click on the Grid Name to view your topics. To create Topics, click on the blue button titled “New Topic”. We have two topics on the graphic below. One in which we asked for follow up on a district wide pilot program and one in which we asked our administrators to reflect on their first quarter. Notice, each topic has link. 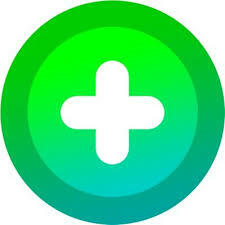 If you were to type http://www.flipgrid.com/c46e07, you would be able to access and add to the topic. There are also editing options available for topics as well under the “Actions” button. When creating a topic, you can customize it to fit your needs. Give it a title and date. Choose a Video Response Time (the free version is limited to either 15 seconds or 1 minute 30 seconds). Type out the directions of what you’d like the users to contribute. Share with students: Click “share topic” button on the topic page. You can copy the URL and paste it in an email. There’s social media interaction with Facebook and Twitter as well as an integration with Google Classroom.